About four months ago, my Bestie was encouraged by her Acupuncturist to go gluten and dairy free in hope that it would make her body as healthy as possible as she attempted a final IUI (just a few more days before she learns the results!). I have many other friends who are gluten and/or dairy free due to recently diagnosed allergies. In every situation, they found themselves healthier than ever before. More energy. Better skin. Weight loss. Fewer (and in some cases zero) allergies. And the best digestion of their lives. Not a single (of my friends anyway) were searching for a health or diet plan. But the unexpected benefit of an overall healthier lifestyle were a welcome reward. I can't diet. When I try to tell myself that I cannot have something, I make it about two hours. I want it more than when it was part of my daily life. I have no willpower. But I suspect that these are all benefits worth chasing in my life. So I decided to add in gluten and dairy free products slowly, rather than eliminate all gluten and dairy from my diet. Make sense? I am not telling myself that any foods are forbidden. Instead I am on a quest to find products and recipes that are just as fabulous but better...because they are either gluten or dairy free. It's an add in plan instead of any sort of elimination. The first thing I tried to add in was a milk alternative. I tried every single brand of soy based milks. And I universally hated each and every one of them. Wretched. The taste, the smell, the color, the aftertaste, the thickness...all disgusting. I made myself drink about half of each container too in hopes that they would grow on me. They didn't. I did however fall in love with almond milk. And will show you my favorite (and least favorite) brands later this week. 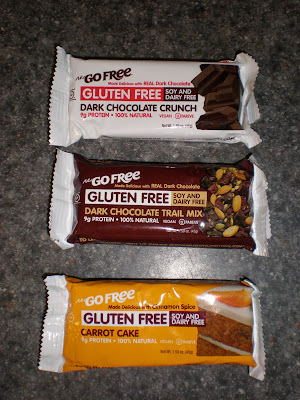 But today I want to share with you some gluten and dairy free snack bars that I recently tasted. Nu Go Nutrition Bar products cater to a wide variety of needs. Gluten free, soy free, vegan, pareve, all natural, high protein, dairy free, organic and more. The chocolate used is real chocolate, even in the dairy free bars. Nothing fake or pretend. Low to modest in fat and low in calories. Nu Go Nutrition Bars sent me six different flavors to try and give you an honest review of each. First up is the Dark Chocolate Crunch bar. Gluten free, soy free and dairy free. It is very very chocolaty. A little too much for me as a breakfast bar but it would make a great afternoon snack. I actually did eat it in the morning but alternated bites with a banana. Which was delish and a very filling breakfast. Next is the Dark Chocolate Trail Mix bar. Gluten free, soy free and dairy free. This was surprisingly one of my very favorite bars ever! It was sooo yummy. I loved the taste of the trail mix with big tasty chunks of chocolate. I could eat this bar every day and be a happy girl. Awesome! Third was the Carrot Cake bar. Gluten free, soy free and dairy free. I thought I would love this but it was sadly my least favorite of the six bars. I ate the whole thing so I didn't think it was terrible. But I probably wouldn't eat it again in the future. It just didn't taste as "real" as all the others- didn't taste at all like carrot cake to me. And I didn't love the texture. The next three bars are my favorite type of snack bar. Composed of only three nuts, three fruits and four seeds. Not only can you pronounce every single ingredient, but you probably have most of them in your pantry right now. I love the simplicity! Fourth was the Raw Natural Lemon bar. Gluten free, soy free, vegan pareve. This was hands down my favorite bar! Amazingly good!! I saved it for last as I suspected it would be my favorite. I have a thing for lemon. Love all things lemon. The flavor was fresh and lovely. I ate it for breakfast but it would make a great afternoon snack or desert. Yummy! This is another bar that I could eat daily and remain a happy camper! Seriously love this lemon bar! 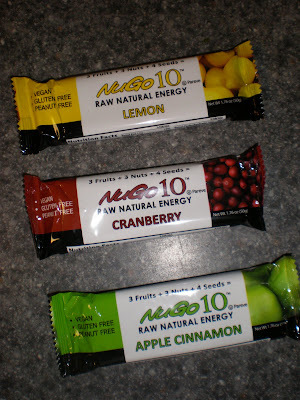 Fifth and sixth were the Raw Natural Energy Cranberry and the Raw Natural Energy Apple Cinnamon bars. Gluten free, soy free and vegan pareve. I am lumping them together because their reviews are similar to the Lemon bar. Very very good! Fresh flavors. They didn't sit in the pit of my stomach all day. They tasted real. Probably because all the ingredients were, you know, real! I would eat them over and over again. I thought the cranberry was such a fun and unique flavor, too. I don't think I've seen another bar that uses cranberry. Mmmm! You certainly do not need to be on a strictly gluten free lifestyle to enjoy any of these yummy treats. They are all a much better alternative to a giant muffin in the morning or cookie in the afternoon. Packed full of yummy, organic ingredients! OOh I'd like the to try these. The lemon one sounds like it would be my fave too. P.S. I tagged you on my blog! They sound amazing!!! I'll have to look for those even though I'm not gluten free! Sounds YUMMY! Can you tell us how many calories are in each bar? Thanks for sharing this! I am in the process of eliminating gluten from my diet and will be looking for these in stores! Awesome! I have not noticed these in stores... I usually eyeball the "green" section at Kroger and Publix to see if any fun GF/DF products pop out at me. I will keep an eye out for these to try. If anyone needs a pure chocolate fix, I will say Enjoy Life's Boom Choco Boom bars are good! As good as my Ghirardelli Twilight bars? Um, no... but they'll satisfy that dark chocolate craving and are GF/DF/SF. I love almond milk! I have been drinking it for years! Even my little boy drinks it as we never gave him cow's milk. Did you see my Nature's Path giveaway? They make a lot of wheat and gluten free products! Thanks for sharing! Looking forward to seeing your recipes and recs as I have been interested in gluten-free. Some of my friends do it and have so much more energy!